In the first part of our adventure we traveled from New Jersey to Kansas City and on to Crawford Hill in Nebraska. 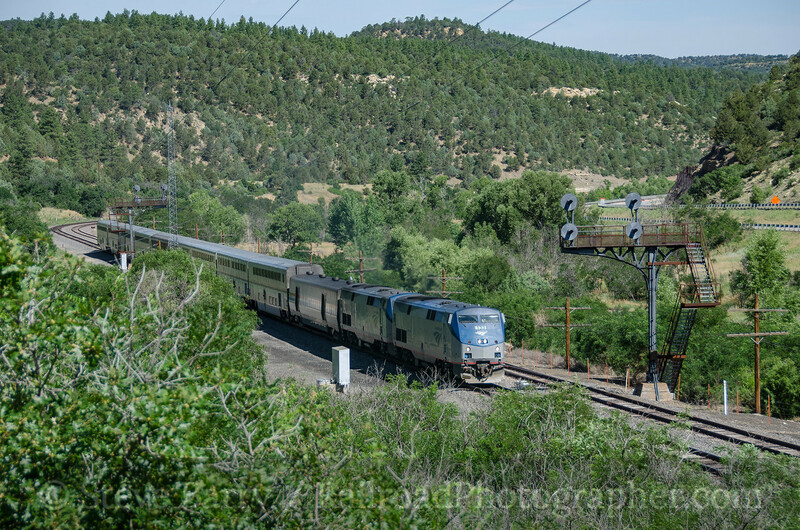 In the second part we chased trains in South Dakota, then hit the Powder River Basin and Sherman Hill in Wyoming. In the third part, we hit a variety of short lines including Deseret Power, Navajo Mine, Apache, and Copper Basin. 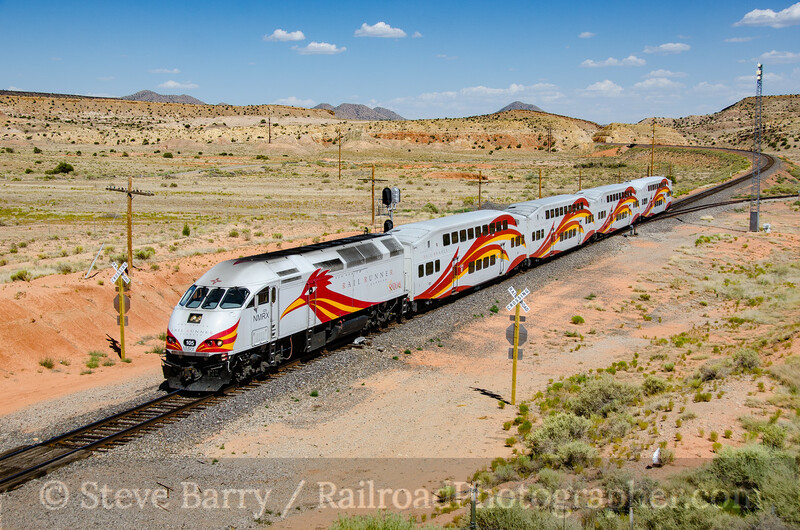 We start this part waking up south of Albuquerque, N.M.
With 5,788 miles put away since leaving New Jersey on July 3, Day 13 started with a commuter operation -- the New Mexico Rail Runner, which sports possibly the best paint scheme of any commuter railroad in the country. 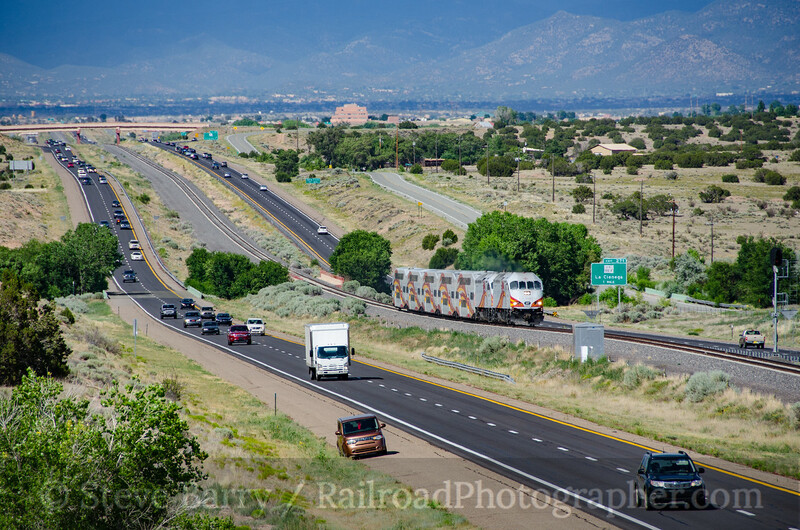 The trains run both north and south out of Albuquerque -- north to Santa Fe and south to Belen. 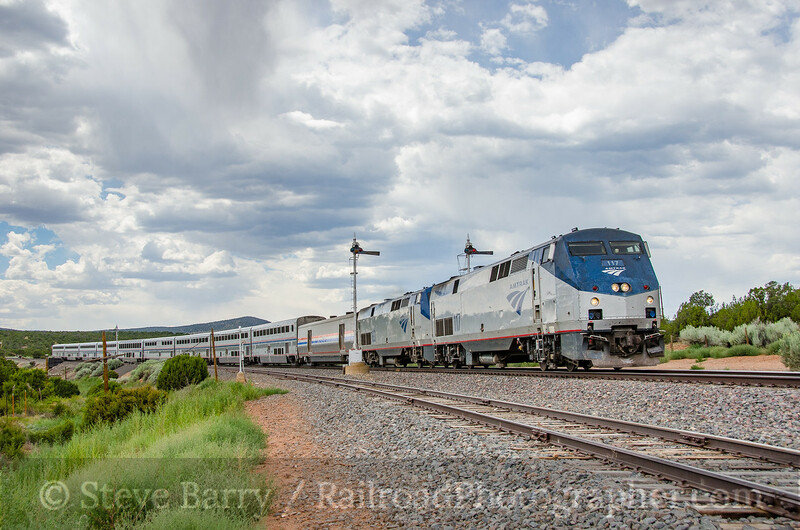 Since the trains would be in "push" mode heading north into Albuquerque, I needed a location that would be a broadside photo (since the engine would be on the rear of the train and wouldn't have its headlight on). 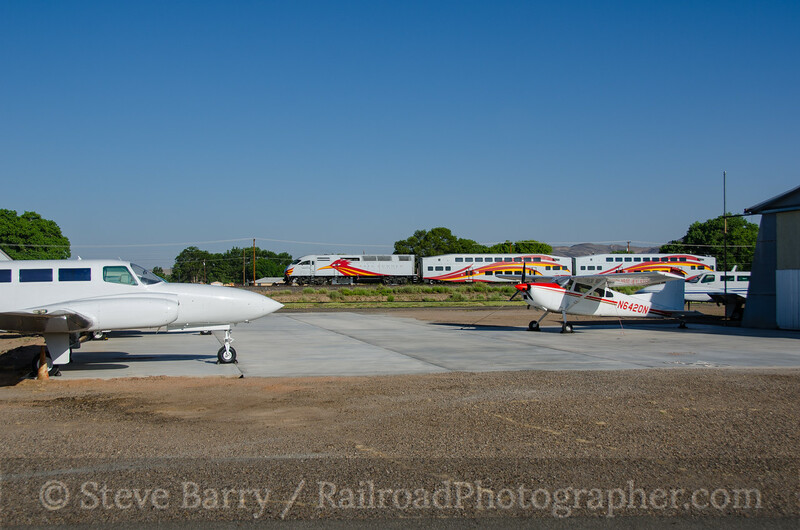 The best shot of the morning was of a northbound train passing a small airport near Los Lunas (above). With some time to kill and the trip about half over, it was time to take Sparky (my 2004 Ford Explorer) to a garage for an oil change. There isn't much rail activity around Albuquerque without going south to Belen to hit BNSF's transcontinental line, so I spent the day poking around for potential shots for the evening commuter rush, as well as hitting the Wheels museum in old Atchison, Topeka & Santa Fe shops in downtown Albuquerque. One shot high on my hit list would be of a Rail Runner coming down the median of I-25 as it heads south from Santa Fe to Albuquerque, and that shot was accomplished near La Cienga. I found a really nice shot I wanted near Rosario, but the remaining daylight Rail Runners came after clouds had built up, making for a less-than-stellar photo. 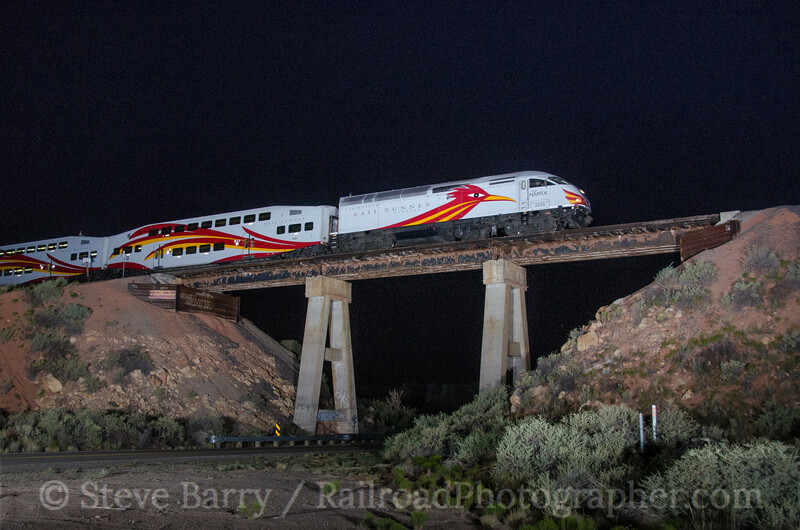 Defeated by clouds for the day, I set up my lights at a different location near Rosario and got the last train from Santa Fe to Albuquerque crossing a small bridge. I then went into Santa Fe and grabbed a motel for the night. Day 14 was a Saturday, so Rail Runners wouldn't be running as often as they would on a weekday. I started the day by visiting the worksite of the New Mexico Steam Locomotive & Railroad Historical Society, which is restoring massive Santa Fe 4-8-4 No. 2926. I spent almost four hours with the crew, watching the work that was being done on the engine. 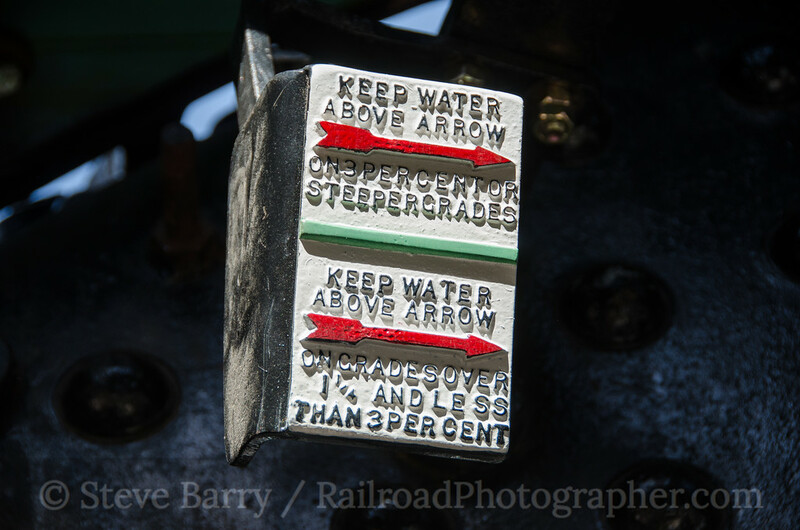 The quarters were cramped and the sun was at the wrong angle, so photography was challenging, but I did like the way the light came into the cab and illuminated the water sight glass warning sign. Scenes of the workers working will probably make a decent post at some point in the future. I was impressed with the plan the group has, both for restoring the Northern and eventually operating it (perhaps as early as 2017). When the crew broke for lunch, I departed the worksite and headed back trackside. 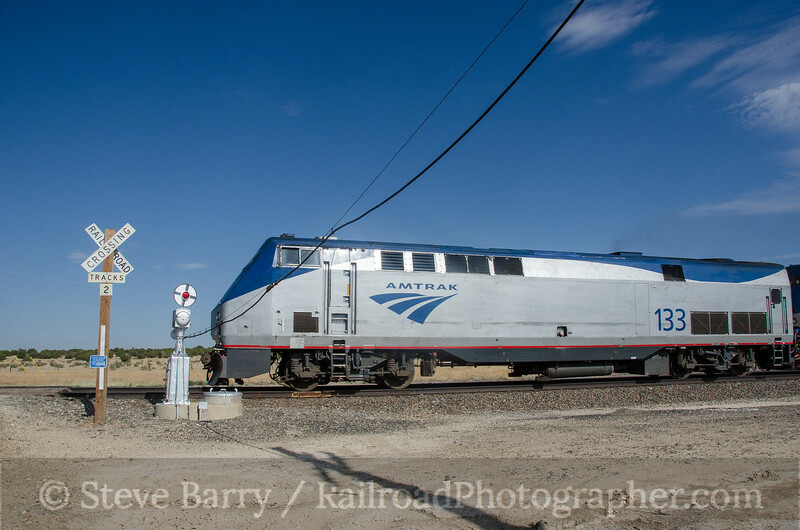 One of the reasons I was in the Albuquerque area was to photograph Amtrak's Southwest Chief, since the line used by the Chief is protected by semaphore signals. At one time these types of signals were common throughout the U.S.; now the line from the Colorado border down to just below Lamy (near Santa Fe) is the last place to find these relics. I found a lone semaphore near Los Cerrillos and waited for the Chief; it did not disappoint. With the southbound Chief now gone (and the northbound had run earlier in the day while I was in Albuquerque) I turned my attention back to the Rail Runners. I still wanted that shot at Rosario that I missed the day before, so I went back and finally got it in sun. Annoying afternoon clouds were once again building, so I headed into Santa Fe where I could shoot stationary stuff when I got a sunny break. 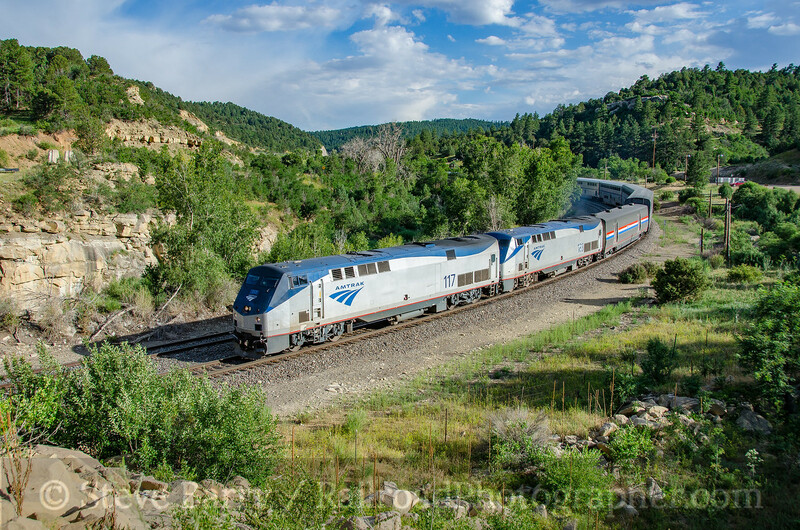 Santa Fe was originally on a branch line of the mighty Atchison, Topeka & Santa Fe, connecting to the main at Lamy -- so the railroad was most commonly known by the name of a town located at the end of a branch! Later, the Santa Fe Southern tourist operation took over the branch. 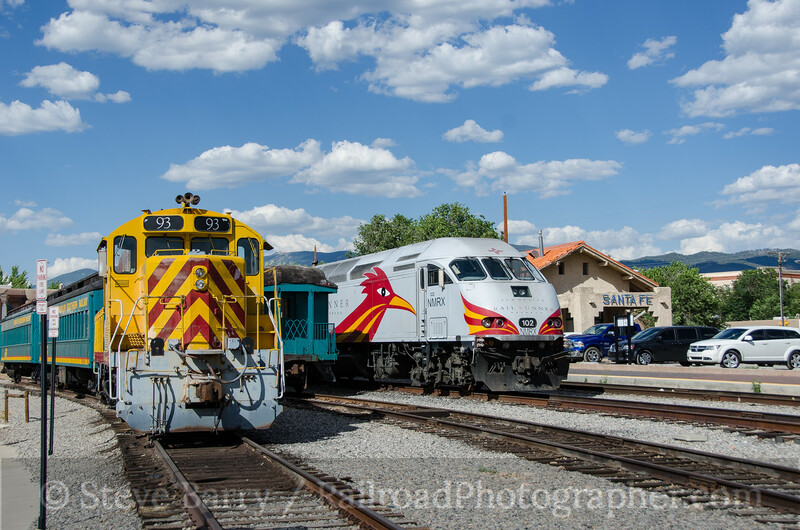 Rail Runner trains use the Santa Fe station, but when service was extended north of Albuquerque the Rail Runners were largely put onto a new right-of-way. The Santa Fe Southern is now dormant, but some of its equipment still shares the Santa Fe station with the Rail Runners. As night moved in, I hung around downtown Santa Fe. 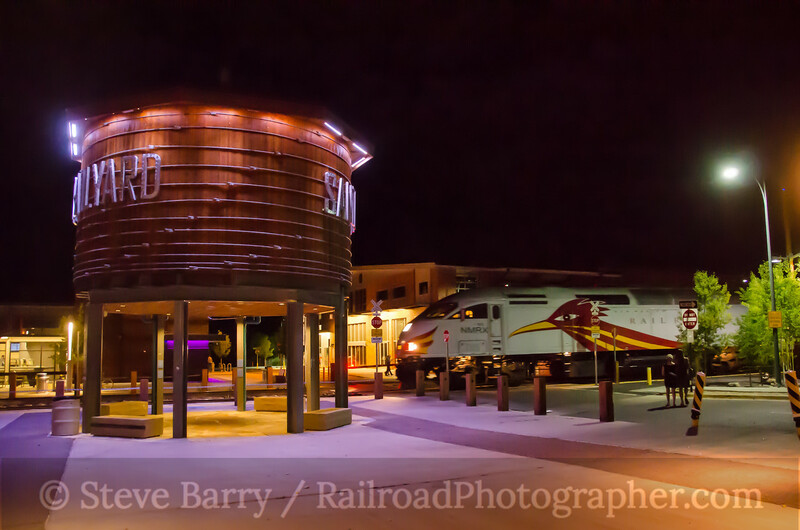 The Santa Fe Railyard hosts some night life, and I listened to a bad ensemble band waiting for the last Rail Runner of the night to depart for Albuquerque. Once I got that, I headed out to a rest area on I-25 and found a quiet spot to sleep. For Day 15, I started focusing on those semaphore signals. 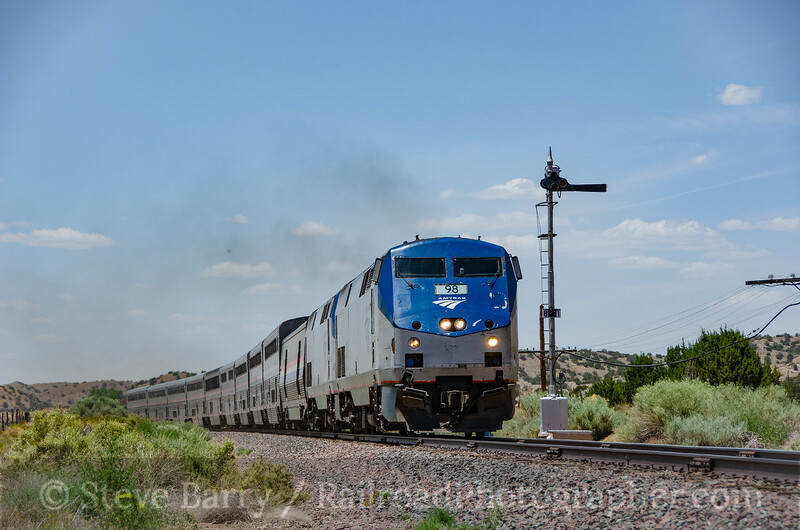 The Southwest Chief can really move along, so the key to getting multiple shots of signals is to get a set north of Las Vegas, N.M., then use the train's stop there to get ahead of it for a set south of Las Vegas. One chase can easily rack up 50 or more miles between shots. The line is only used by Amtrak, so only two trains go past the signals each day -- the Chief in each direction. I got the southbound train at Wagon Mound, N.M., then easily beat it during its stop at Las Vegas to get it again at Chapelle. I waited at Chapelle and got the northbound Chief there as well. Using the Las Vegas station stop, I got the train again at the ghost town of Colmor, about 60 miles later. Somewhere north of Wagon Mound the string of semaphores end. 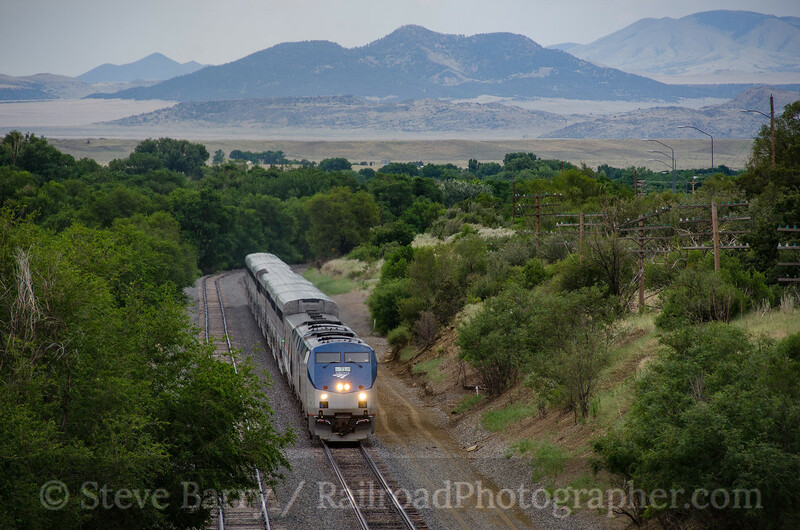 After clearing the town of Raton, N.M., the line crosses into Colorado while climbing and descending Raton Pass. After a high-speed chase through the semaphores, the chase over Raton is anything but... 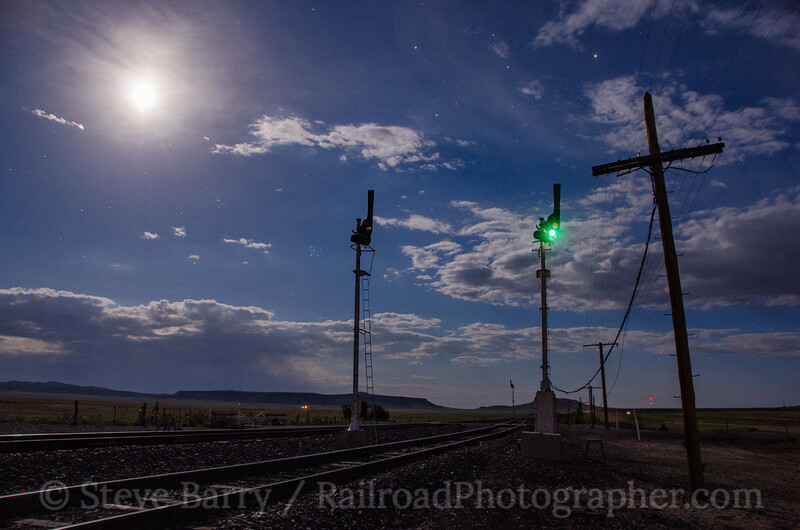 I was able to catch the northbound Chief multiple times on the pass, including at Gallinas, Colo.
For the second night in a row I headed into the semaphores to get shots of them under the stars. The first night I did okay with them, but I did better the second night, especially the set at Levy, N.M. It was the only semaphore set I found that had one of the signals lit. After finishing with night shots, I headed to a truck stop on I-25 that had a nice, large, quiet parking area for autos. Day 16 started with driving into Colorado in search of a ghost. Way back when, grade crossings were protected by devices called wigwags -- a target that moved back and forth like someone waving a flag when a train was approaching the crossing. The rumor was there was still a surviving, functioning wigwag in the ghost town of Delhi, Colo. Arrival there proved the rumors were true -- for no apparent reason there is a wigwag guarding a dirt crossing in a ghost town. Like the semaphores south of it, only Amtrak's Southwest Chief passes here. I got the southbound Chief and commenced the chase back towards the semaphores. Using the train's stop at Trinidad, I got the train as it began its ascent of Raton Pass. Almost as rare as semaphore signals are searchlight signals, which have one lens that displays the three colors. There are a couple of sets of searchlight signals on ex-Santa Fe cantilever signal bridges near Gallinas. I couldn't find a good way to track level here, and settled for a view from the adjacent dirt road. 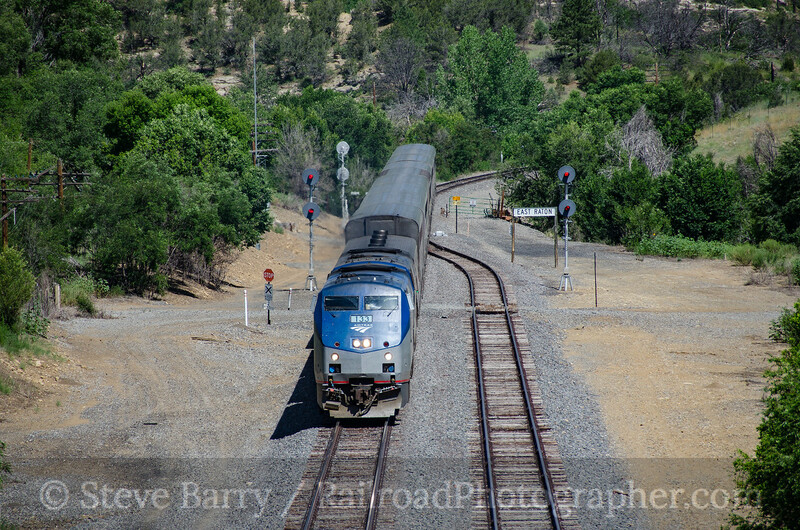 I used the train's slow climb up and over Raton Pass to get ahead of it again, beating it easily to the overhead bridge just before entering the town of Raton. 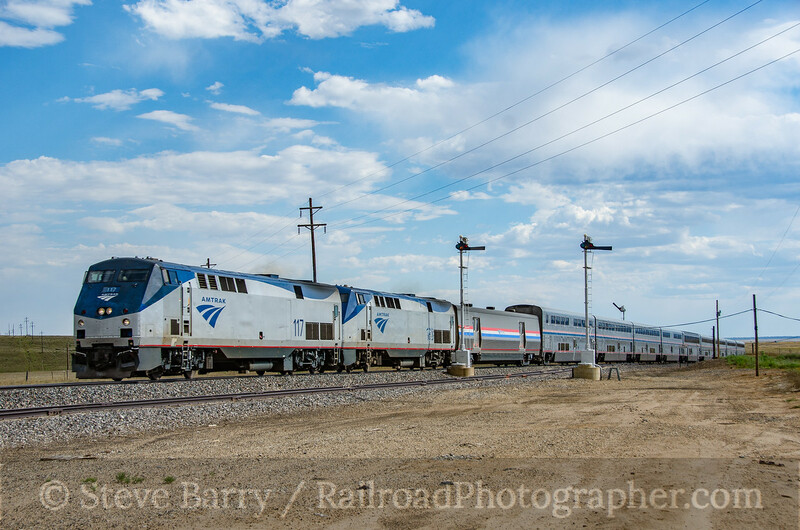 Once again I wound up chasing the Southwest Chief down through the semaphores, getting it on either side of the Las Vegas stop. I then chased the northbound Chief, once again getting it once on each side of Las Vegas. Sun angles and clouds meant my results weren't as good as the previous day, so the next shot I was happy with was from the same bridge as above, getting the train as it pulled out of Raton and headed for Raton Pass. Once out of Trinidad, it was time to head for Denver. The convention of the National Railway Historical Society was taking place in a day or two, and -- after all -- that was the primary reason I was out here. I headed into Denver and went to my motel -- one I would have for the duration of the convention, meaning I'd have a real bed for more than one night in a row for the first time on the trip. The long drive to Delhi in the morning, the long chase of the Chief both ways, and the drive to Denver made this 16th day one of the longest of the trip -- 741 miles of driving in one day. But things would now slow down a lot for the convention. I hit the sack in Denver with 7,435 miles so far logged in on the road.